Larry continues, "One of the photos Ray sent after the Shootout shows how much the century plant was leaning out into the yard. We were afraid it would fall over, so I anchored it to the house and erected a brace under it to hold it up. The brace is made from 14 foot 2x4's which are not half way up the flowering stalk. We think it is over 30' tall. 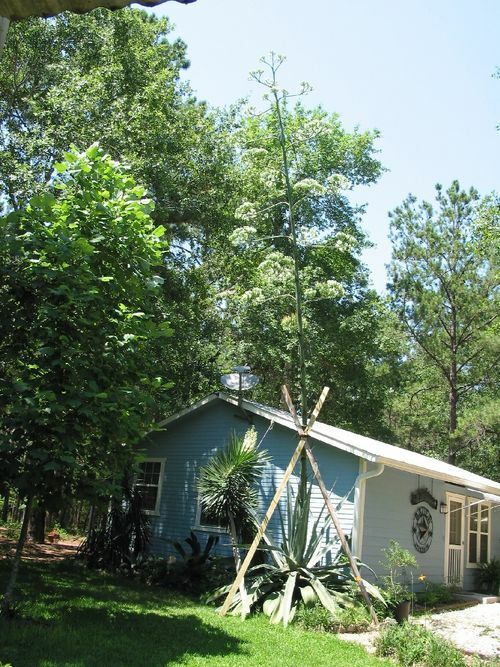 The Yucca was also falling over, so I braced it up as well." To comment on any photo or photo album, see instructions at top of main post.